Each week I look through hundreds of Pens on CodePen, looking for what I feel is the best. Things I look for are creativity, innovation, simplicity, functionality, etc. This week for our favorite Pen of the week we bring you a World War 2 Soldier Profile Generator. In essence, this Pen generates a fake profile of a WWII soldier with all of the information from the soldier's portrait to a fake military ID number. In case anyone was wondering, this is shameless self promotion for one of my latest Pens. As lame as that may be I still think it's worthy of a mention and a spot on our favorite Pens of the week list. 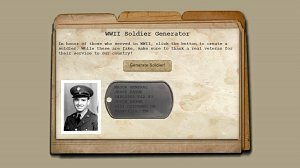 See the Pen World War II Soldier Generator by Nick Santini (@npsantini) on CodePen. There are a few things wrong with this Pen and i'm not afraid to admit it. First off, it's not responsive. I mean come on, it's 2015 and it's not responsive? I know, I need to get with the program. If you know of ways to improve on that Pen let me know in the comments below or simply fork it on Codepen. On a serious note, if you read this, please go thank a Veteran for their service!